The London Marathon. It's one of the marathons around that is likely to be on most marathon runners' bucket lists. But with more people entering the ballot each year than there are places, the chances of getting a place are slim unless you've got a Good for Age time or a charity place. So, how did I manage to run the London Marathon for free? This post is a tiny bit late but with house renovations and a few other things still happening, I haven't had the chance to write about a few of my recent races, sorry! A few weeks before the London Marathon, and it was that time of the marathon calendar, where people were doing their longest long, slow runs (LSRs) and starting to worry about tapering. I had originally planned not to run any spring marathon. The aim was to continue doing LSRs every Sunday, do a few track sessions and just really to work on maintaining my endurance capabilities. In a way, the components of my training, was very much like a marathon plan, but without a specific marathon to work towards. In those last few weeks before the marathon, I really started to get fomo. Yup: Fear of missing out. I started looking for spring marathon available near the London Marathon date and narrowed it down to two: The UK Boston Marathon (I'll post about this later) and another. This last one was the way that let me run the London Marathon for free, and I'm going to tell you more about it. Don't worry, it's nothing rogue. Totally legal and legit. It's the nohtaraM nodnoL ehT. If that hurts your head, it says The London Marathon backwards. Say what? Yep. It's not running the marathon backwards, but rather running the London Marathon the opposite direction - our starting line was the London Marathon's finishing line and its starting line was our finishing line! The backwards London Marathon took place at different starting times - 2am, 3am and 4am with the aim of finishing before the London Marathon started - okay, it wasn't the official London Marathon, but it was pretty much the same race, but the route completed the opposite way, and much, much earlier. Plus it was free and no booking necessary. Just turn up at your chosen start time. I arrived at the glamorous meeting point of Mcdonalds, in Charing Cross, for the 3am starting point ; a large crowd of lycra-clad (mostly men) people stood out from the groups of people gobbling down their post-night out treats. How we stood out! There were countless jokes - "I think you woke up early - the London Marathon starts at 9am." After it seemed like most of us had arrived, we started walking towards the Pall Mall area. Someone shouted out if we all had our Garmins at the ready, and before I knew it, our marathon began on the dark, quiet and empty streets of London. It was surreal. We were one large group of runners socialising. This really was no ordinary marathon. There were all sorts of runners in my group - some had run previous the official London Marathon before. Some hadn't run a marathon in a few years. And then there were the ultra-runners: many were using this as a training session for 100 mile+ races they had planned later on in the year. A handful were going to also run the official London Marathon straight after. I learnt a lot about ultra runners during the marathon. Like did you know a lot of ultra-runners regularly wake up at 2 or 3am for a long run because they need to be able to run on little sleep for some of the ultra-distances they do? Crazy, crazy, crazy people! But it was interesting, because I also discovered there are two types of ultra-runners; those who despise the marathon distance and those who quite like it. Ultra-runners are an interesting part of the running community. I can't really complain about the route itself - this is an unofficial race and the route we followed was based on the the official London Marathon signs. I can't imagine those running the official marathon get lost during the course! There were only two points of the course where we got lost - at Canary Wharf, near the 20km of the official marathon, and the last few kms to our finishing line (the official marathon's starting point). But I quickly learnt this marathon isn't a marathon where you aim to achieve a pb. It is more about meeting people and enjoying yourself. Getting lost was part of the fun. At one point, when the sun started to rise, a runner's girlfriend came out of her house (in pjs) and brought out lots of bottles of water for us. Instead of taking the bottles and running on, we all took it as as moment to gather our thoughts and carry on talking. This marathon is very much based on the self-sufficiency of the runner. You run with everything you need. 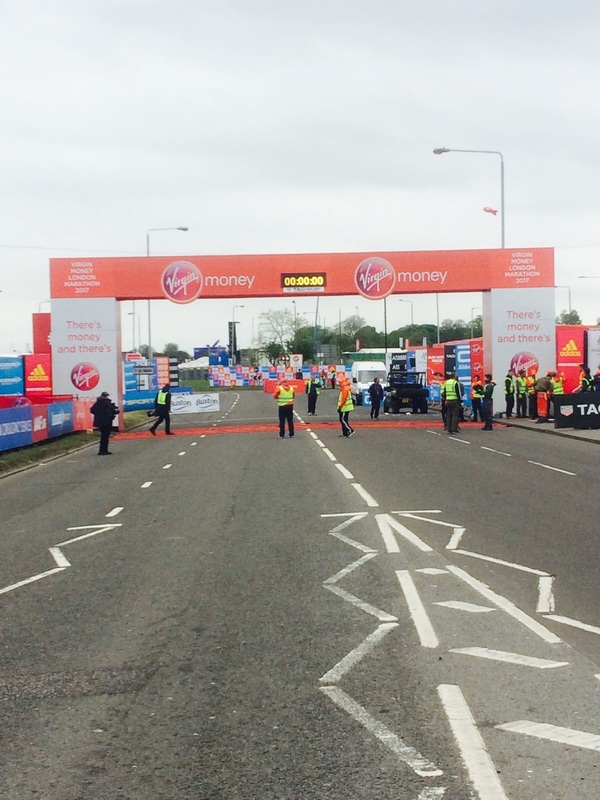 Unlike the official London Marathon, there are no marshals, water stops or loo stops. If in need of drinks or snacks, there are petrol stations that we ran past and after 5am, some of the convenience shops started opening too, but these are all fairly scattered and as we ran into the more residential areas, the shops were scarce. I'd advise you to pack everything you need - drinks, running fuel, any additional layers of clothing, cash and cards and banter. The portaloos that were out for the London Marathon were locked up though as we neared the official London Marathon's starting line, they were being unlocked by officials. Around 6am, the marshals and volunteers for the official London Marathon started appearing on the route, as they began preparations. Apparently the backwards London Marathon is a regular occurrence, so when they saw us, they cheered and handed us drinks from the water and Lucozade stops. Getting lost in the last few kms of our marathon was down to an official London Marathon marshal pointing us in the wrong direction, so my total mileage for the unofficial event was 48km. Technically, I ended up unintentionally running an ultra! After running the backwards London Marathon, it has sparked interest in running the official London Marathon. Later on in the day, I went to my run club's cheering point and the atmosphere really was different to any of the other marathons I've previously ran. But would I run the nohtaraM nodnoL ehT again? I think so. Would you run the backwards London Marathon? Is there anything you want to know about the backwards London Marathon.